Julie wanted to lean out and hopefully not suffer some of the conditions that have plagued her family. 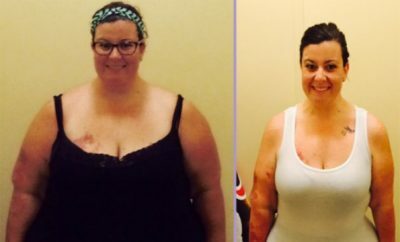 In this transformation she manages to lose 25 lbs. and a whopping 16% body fat. 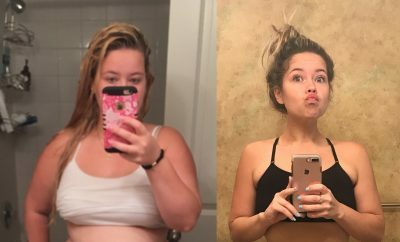 See how she made these amazing changes! With all of my family’s health issues, from diabetes all the way to heart disease, I decided in my mid 20’s that I didn’t want to have any of those problems and now was the time to do something about it. I am also a clothing designer and want to be able to look HOT in my own clothes. Over the last several years, I have tried all kinds of methods of weight training and diet plans, from personal trainers, nutritionists, group classes, and even built an at home-gym in my garage. With all of this, I was able to get off some weight and body fat but not to the degree I had hoped. 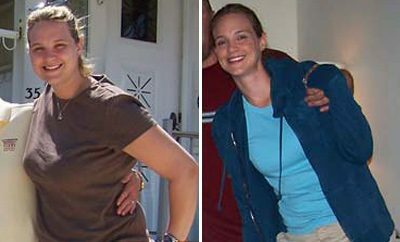 At some point during this time, I was on the internet and came across Shara Vigeant’s transformation on Bodybuilding.com. After seeing her, I knew what I wanted to look like. I made the attempt to figure out how to do that and ended giving up because everyone told me that it would take several years to look like that. I was discouraged and basically went back to what I was doing. Last December 2005, it hit me that I really wanted to be lean and muscular. The image of Shara stayed with me this whole time and helped me realize that I wanted to put in all that time and effort if I could achieve a body like hers. 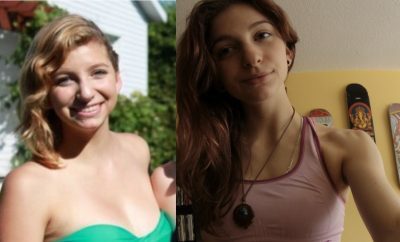 I researched more on the internet and kept coming up with the name of a nutritionist/trainer Kim Oddo, from ‘Body By O’. I thought, if professional figure competitors were hiring him, I thought “How could I go wrong?” I ended up calling him and signing up for his 12 week Transformation program to see what it could do for me. After the 12 Week Program, which consisted of a personalized weight training program and nutrition program, I had lost considerable weight and body fat. I was so proud of my body that I thought, “Let’s keep going, I want to compete!” So, I signed up for a competition diet program with Monica Brant’s BodyRock 2006 on July 8th being my target date. Through this competition diet program I was able to reach an awesome weight and body fat percent that I was just amazed!!! For the entire first 12 week program, I did all of my cardio and weight training in my garage where I built an at home gym. I was able to be disciplined enough to follow Kim’s directions and get in there and do the job. I was truly impressed with how he knows exactly what to do to get you to your goal. Once I decided to do the competition prep diet, I decided to hire a personal trainer and also join LifeTime Fitness. I was lucky to find Andrea Dumon, who is not only a personal trainer but also a professional figure competitor. Training with her once a week, she made sure that my body developed in correct proportions. She also helped me with posing, suits, shoes, all of the things you need for a show, etc. She has become a great friend and I can’t ever thank her enough for all of her love and support. For the first 12 weeks I trained 3 days a week, always alternating upper and lower body. I did 7 days a week of cardio. The biggest difference between the above and my competition weight training is that the weight training was broken up by body parts. Back, arms/legs, shoulders, legs, chest with 2 days of just doing the cardio. Set a goal and then follow through. Find like minded people that you can learn from as well as inspire. I could not have made it without talking to someone who knows what I’m doing and has been through it. Don’t be afraid to ask questions. Don’t be afraid to succeed. Don’t be afraid of the power you have that comes from within – it shows up in full force when you get proud and confident! No matter what, like yourself throughout every stage of your life and each transition you make with in it. One of my personal secrets – I’m 5’2 1/2″. People think I am much much taller than that – why? When I walk, I walk like I’m 6’2 1/2″ – that is the image I project. You can create your own world/image. Why not start now and create something awe inspiring! I plan on continuing to work hard with Kim Oddo and Andrea Dumon. After competing in BodyRock 2006 and GNC Los Angeles, I am taking the rest of the year as off-season to build up more lean muscle and bring down the body fat just a little more. On stage I want to be a good 10 pounds heavier with muscle and about 3-5% less body fat. I’d like to come back next year and actually expect to place in the top 5 of a competition. This endeavor has also helped in all other aspects of my life. I have put the same dedication and discipline in to my clothing line and have seen immediate results. I am thrilled that I look great and am able to wear my designer line of jeans and have heads turn. It is one of the greatest feelings in the world when people think you are a celebrity because you look and act like one. I just want to take a moment and thank everyone who loved me, supported, and encouraged me. I love you all and hold you in my heart forever! I have to give the biggest thanks to my husband, Brent, because he is the one who was there the whole wild ride and will continue to be there no matter where the ride goes!! !